Starting today (22.06.2012), I’m listing conferences that seem interesting to me. Don’t spam my mailbox if your conference is not here, I can’t list ’em all and the point is not to repeat the exact same info that’s on distribution lists already. It’s just to highlight some of the range of topics that I’d find interesting if I could live more than 4 lives at the same time ;-). As usual, drop me a comment if you have suggestions not on this list. 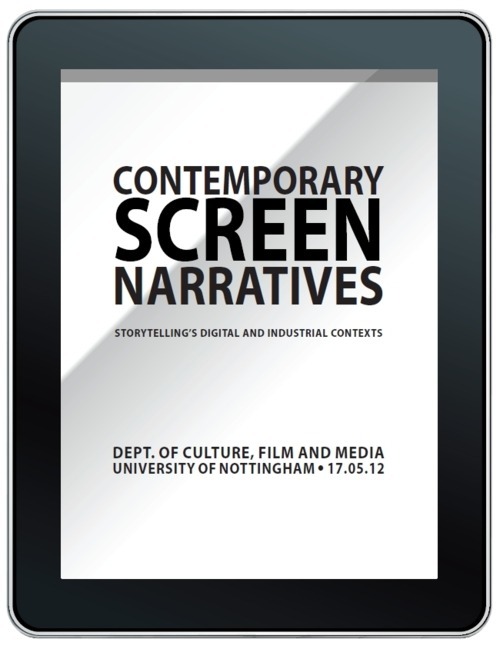 The Contemporary Screen Narrative conference took place on 17 May last.Review of that conference soon to be published ? One never knows. Was fantasmatographically interesting though ! Domitor 2012. What more can I say ? Well, actually, I’ll be saying a bit more about it, soon, on this blog. I’ll be posting some quick notes about the panels I attended and all the stimulatingtalk there was. The topic, by the way, was “Performing New Media, 1895-1915”, and it was June 18-22 last. Received this in the mail this morning. The afterlife of the film song, a symposium at the University of Bristol on Dec 8, 2012.Probably won’t be going myself, but if you’re into film music, transmedia, and the virtual life of mass art products, this could be for you. This conference I’ll be going and presenting a paper on the dream of a domestic film reception in Hollywood’s 1920s reception practices and discourses. It’s the 17th SERCIA International Conference in Dijon, Sept. 5-7, 2012. Hope to see you there ! In my dissertation work, I write a little about some contradictions in 1910s-1920s reception discourses of “ethnographic documentaries”/travelogue films that travel the length of the globe to find non-Western cultures in their supposed “pristine” state, and immediately proceed to overwrite them with western media discourses — reenacting, as it were, the primal enchantment of cinema as it has come to be canonically enshrined in the “train effect”. Cannibals, of course, feature prominently in such films as the Johnsons’s Cannibals of the South Seas (1912) — especially for their contrast value to the perky, petite, and quite white Mme Johnson. I’ll be thinking of making a proposal along those lines to the April 2013 conference in Manchester organized by the Hic Dragones group, on Cannibals: Cannibalism, Consumption and Culture. The call for papers is now online (deadline: dec. 31st).